Minhang policewoman Shen Shumin has been honored as a “National Good Police Officer." She is now serving in Hongqiao, where 23,000 foreigners registered in her area. 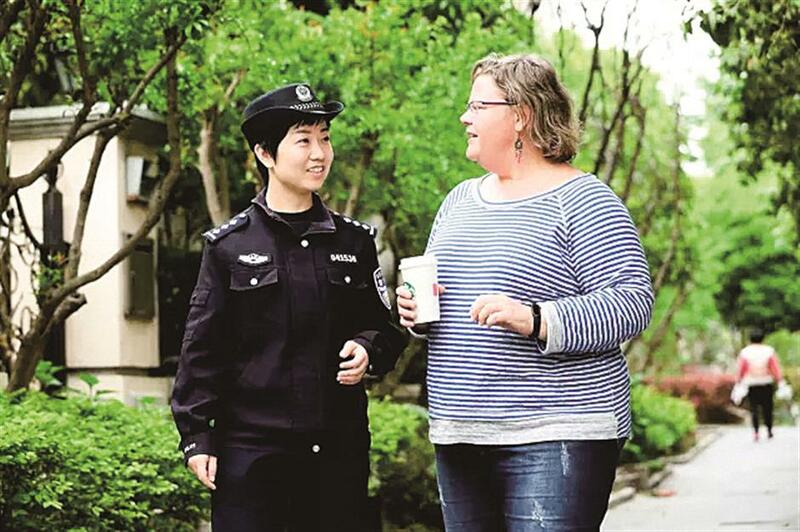 Sheng Shumin chats with a foreign resident during a routine patrol in the community. “One perk of being a policewoman is that I always had stories to tell on a blind date,” said Sheng Shumin. Though her dating days are over and she is now married and the mother of a two-year-old, Sheng’s police work continues into its ninth year. Recently honored as a “National Good Police Officer, she transferred two months ago to the Hongqiao branch of the Minhang Police. It’s a different beat from the past, with 23,000 foreigners registered in her area. When a Shanghai Daily reporter met her, Sheng was dealing with three Koreans involved in a fight with a Chinese. Earlier in the day, she said, she nabbed several Filipinos for stealing battery from mopeds. Sheng approaches the people, no matter what their ethnic origin, with a smile. When not stuck in the office, she likes to patrol the streets, chatting with residents to hear their concerns. She recalled the time she discovered an illegal kindergarten operating for Korean children. The teachers didn't have certification. The site had no fire or security apparatus. But Sheng was reluctant to close down the school because she was concerned about the plight of the children. So she set up negotiations with Hongqiao Town officials, and the school was eventually certified. With more foreigners coming to the city, the job gets even busier. In the past, conflict in multinational communities usually centered around complaints about dogs and noise. Nowadays, the cases are more related to theft, arson unregistered businesses and illegal migrants. Sheng tries to take it all in stride. Sheng and her colleagues often have to deal with foreigners who are arrogant. A British man had a conflict with his neighbor about construction noise, even though the neighbor was strictly following construction rules. But Sheng protected the rights of the neighbor and resolved the issue by arranging for the pilot to stay in a hotel temporarily. Sheng graduated from the English department of Nanjing University with no particular idea of going into law enforcement. Her family worries about her safety and the odd hours she sometimes keeps. But Sheng never complains. “I rather think this is the job for me. It’s rewarding to deal with people under new circumstances every day,” she said.